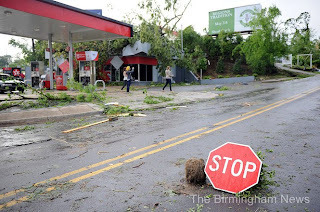 You have no doubt by now heard about the devastating tornadoes that have ripped through the South - you may have even experienced some of the strong storms yourself. We hope all of you, your family and your friends are safe and sound. Our thoughts and prayers go out to everyone affected by these terrible storms. As relief efforts begin, the Red Cross is asking for donations to help provide shelter and assistance to storm victims in the hardest hit areas. To make a donation to the American Red Cross Disaster Relief, visit their online donation page. The Salvation Army Emergency Disaster Services is another organization assisting tornado victims throughout the South, mobilizing feeding units and providing support where needed. You can also call 1-800-SAL-ARMY and donors can text "GIVE" to 80888 to make a $10 donation. Checks can be made out to the Salvation Army Disaster Relief, P.O. Box 100339, Atlanta, Ga., 30384-0339. Please be safe as the storms continue to make their way east and north up the East Coast. And please keep everyone in your thoughts and prayers as the recovery begins. I will be traveling to Tuscaloosa on Saturday to take whatever anyone can donate. My family lives there and are luckily ok but my mom said everywhere is sold out of water. Water & food are very important there right now. Also, any food, shoes, & blankets would be great! If anyone can donate anything please contact me. I live in Clemson. My e-mail is krissyrock1189 at gmail dot com. THANK YOU!